Disclosure: My trip was a hosted media visit, but all thoughts and opinions are my own. 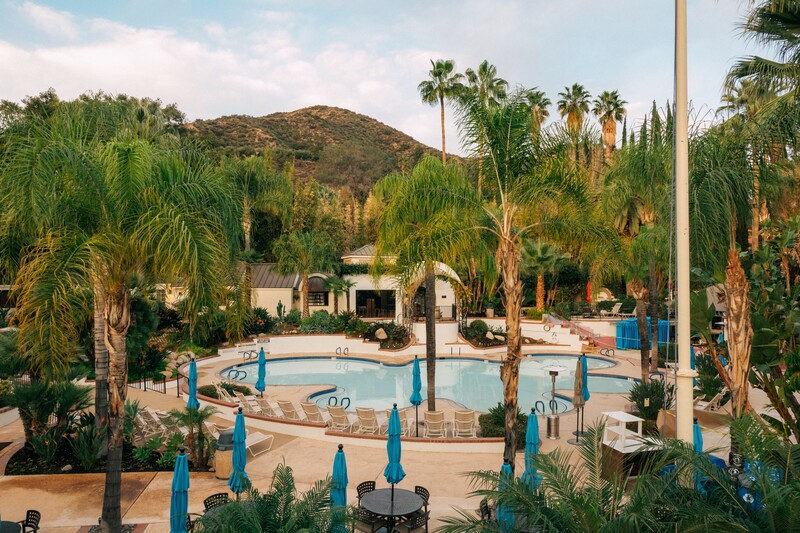 Recently, I took a little day trip to Corona, CA to visit one of my favorite places to relax and getaway: Glen Ivy Hot Springs! If you’ve never been before, Glen Ivy Day Spa is a beautiful oasis surrounded by mountains and trees, where you can get facials, massages, swim in pools, soak in the mineral hot springs, lounge in hot tubs, have some lunch or grab a cocktail and enjoy a glass of wine…there are many other experiences offered on site, too, those are just a few! After our skin care education, we go to experience the /skin regimen/ products first hand during a facial. I had never gotten a facial before, but the combination of the aromatherapy, my skin feeling soft, and a face massage, I felt incredibly relaxed! I can’t believe all these years I’ve been missing out on them – it’s definitely going to be a must-have monthly routine now. Getting a facial not only made my skin soft, but it made me aware of how much I tense up my facial muscles, so that I can be better about relaxing my face in everyday life. After our facials, we got a 50 minute massage, which focused on our legs and feet. Being a runner, this was very relaxing, and it made me feel like I was walking on pillows afterward. I frequently have sore feet from running, and now for the last couple weeks haven’t been having foot pain since receiving the treatment at Glen Ivy. After our treatments, we were able to enjoy a lunch that had a menu filled with ingredients that are good for your skin! My two favorite menu items were the Muesli (it was topped with nut butter, and I LOVE anything with nut butter)! And I loved the lentil veggie sliders, grain bowl salad, and maqui berry fudge. Once the media day was over, I lounged with my friend Heather Traska, who also was at the media event, as we relaxed in the beautiful pools on the warm sunny afternoon at Glen Ivy Hot Springs! To learn more about Glen Ivy Hot Springs, you can visit their site here. Oh did I mention…there’s a Starbucks on site too!